After a huge gain in oil prices on Monday, markets posted some small losses yesterday amid profit taking. Crude prices, which opened the week at $55.97, lost just seven cents yesterday to close at $57.20. Today, after seeing prices drop in the morning, crude prices have rebounded and are slightly higher, up 9 cents (0.2%) to trade at $57.29. Refined products saw somewhat steeper losses yesterday, with diesel shedding 1.5 cents (0.8%) and gasoline shedding just under a penny (0.5%). Today, both products are moving higher. 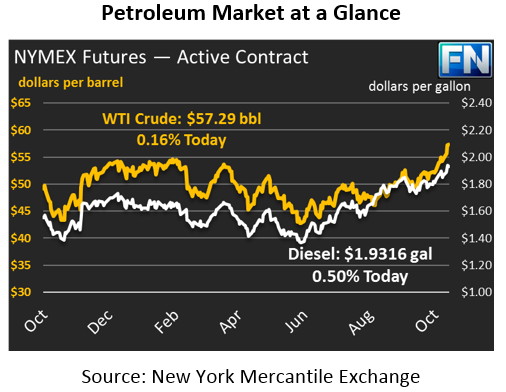 Diesel prices are up a penny (0.5%) to trade at $1.9316, while gasoline is trading at $1.8301, a gain of 1.5 cents. The API and the EIA had conflicting reports this week, though both showed diesel stock draws of over 3 million barrels (MMbbls). This morning, the EIA reported a surprise stock build of 2.2 MMbbls, a bearish indicator that crude markets are not as tight as current prices have made them out to be. On the other hand, gasoline received support from a strongly bullish 3.4 MMbbl draw, compared to a small build reported by the API. The EIA’s report today is being taken as bullish for refined products, which has spilled over to crude prices despite the surprise build. Yesterday the EIA released their annual Short-Term Energy Outlook, which showed little changes in fundamentals. The agency did revise their 2018 demand slightly higher (just 80 kbpd), but also decreased the 2017 projection for demand. Geopolitical tensions continue in the Middle East, though a report from Platts ponders whether the conflicts will truly escalate to a dangerous level. The two countries are part of OPEC and are strongly committed to controlling energy markets. Whether the two will allow military/political conflicts to get in the way of manipulating oil prices is yet to be seen, but economic linkages often help smooth over political tensions.